Win a $50 Gift Certificate to Rockit Bar & Grill! Congratulations to Jason Nadziejko on winning our eleventh High Five Giveaway and thank you to all who entered. It was the most popular High Five Giveaway so far! 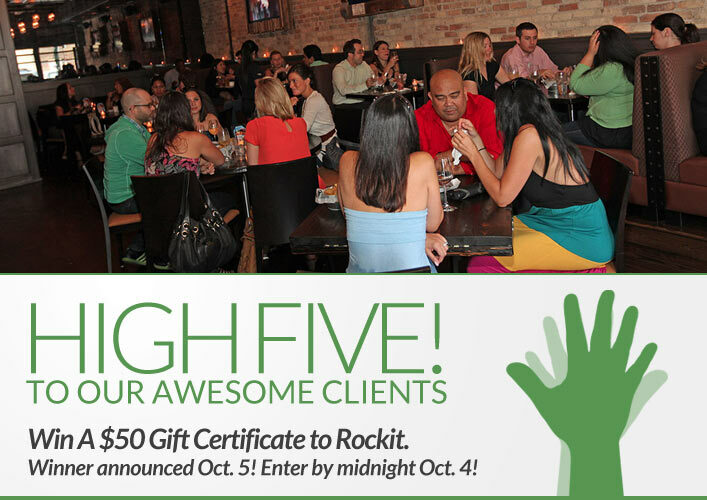 Our next High Five Giveaway is for a $50 gift certificate to Rockit Bar & Grill! Rockit Bar & Grill, located in the heart of the booming River North Neighborhood puts Executive Chef Amanda Downing’s contemporary culinary twist on the traditional bar and grill. Offering outstanding casual American cuisine, using the freshest ingredients available in a mouthwatering menu that includes salads, sandwiches, and entrees. Rockit Bar & Grill is the premier downtown bar and grill, with the famous Rockit Burger being named the best in the nation by “Good Morning America” as well as the restaurant itself being called one of the top concepts in the world by Conde Nast Traveler. Rockit is located at 22 West Hubbard Street, Chicago. Visit their website at www.rockitbarandgrill.com or call them at 312-645-6000 for more information. Our recent blog post was all about bangs. We used photos of four celebrities to illustrate the various bang styles. What is the name of one of the celebrities? Hint: Check out the post here! Now, just add a comment to this post with the right answer to be eligible to win! The winner will be announced on Friday, October 5. Entries must be received by midnight on Thursday, October 4. Good luck! Cameron Diaz is the celebrity with round-shaped bangs! !